APS08G 8-port 10/100/1000M 802.3at PoEswitch meets the demand of high power PoEnetwork appliances seamlessly with fast Ethernet connection. Up to 150W power-output, APS08G feeds Max. 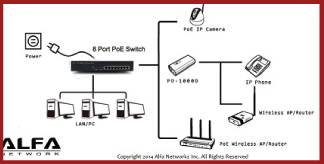 30W per port to PoE-enabled devices via standard Cat.5E / Cat. 6 cable. With power and data over Ethernet from one device, APS08G not only simplifies cabling tasks, but also extends remote power supply to PoEPD devices (IP camera, wireless AP, or IP phones) at Max. 100-meter distance. APS08Gis environmental-friendly, supporting latest energy-saving technology, Energy-Efficient Ethernet mode (EEE; defined in IEEE 802.3az) to reduce networking system power consumption. NO configuration needed, APS08G negotiates and determines the required power output for connected cable length/device.